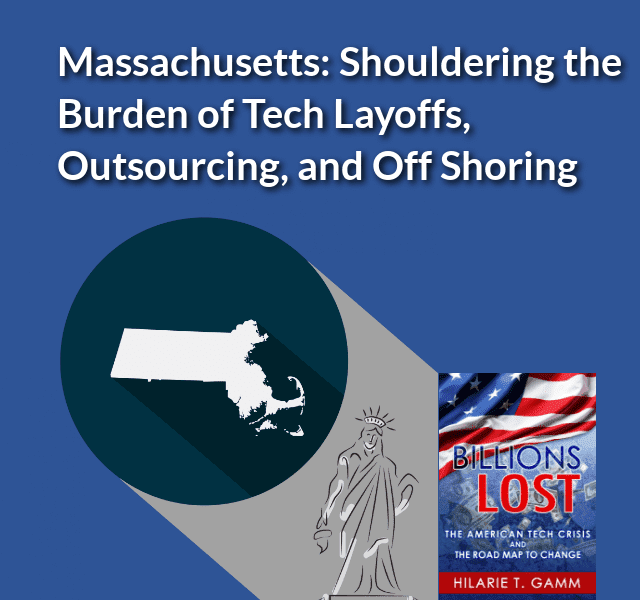 With a strong economy and many technology jobs, Massachusetts is shouldering the burden of tech layoffs, outsourcing, and offshoring. Upon initial inspection, the Massachusetts economy is thriving. Houses sell in just days, recent college grads can always find work in the state’s many retail outfits when white-collar professional work is sparse. The state also ranks high for the number of patents issued and the amount of venture capital flowing into the biotech and technology sectors for cutting-edge ventures. All of this adds up to a dynamic job market with the opportunity for many to succeed. As good as it is in the Bay State, in this year alone there have been skilled worker layoffs at multiple employers sending technology work offshore. EMC, Stratus, Allegro MicroSystems, CompuShare, and Avid are all Massachusetts-based tech companies who have laid off MA-based tech workers and moved their jobs to China, India, Thailand or the Philipines. In addition, companies like State Street, HP, Ericsson, IBM, Staples, TJX, Partners, Guardian Life Insurance, Teradyne, and Putnam investments have also either laid off or are in the process of laying off MA tech workers in an effort to decrease labor expenses by relocating work to India, Croatia, Costa Rica, Thailand, Bulgaria, and other lower cost global technology centers. What many don’t realize is that it’s not just technology companies that hire foreign workers. Massachusetts-based organizations in every industry including healthcare, retail, media, and pharmaceuticals are also using foreign labor to augment their teams and provide lower labor cost options. To make matters worse, sometimes work is sent overseas permanently, where captive foreign labor forces replace entire U.S. based technology departments or testing facilities with no hopes of the jobs ever returning stateside, let alone to Massachusetts. This is the case for Fidelity Investments, which today relies heavily on its offshore technology workforce in China. 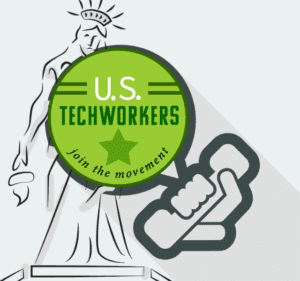 Visas are used by a variety of companies to bring in foreign technology workers into the U.S. Among them are consulting companies who boost their profits by employing a mix of U.S. based labor and foreign-based labor. Those consulting companies in the Bay State with the most dependence on visas are: Deloitte, Ernst & Young, McKinsey and Company, Price Waterhouse Coopers, Cognizant Technology Solutions, MasTech Digital Solutions, Tata Consultancy Services, KForce, Wipro Limited, MindTree Limited, ZS Associates, HCL Technologies, and CSC (Computer Sciences Corporation). Foreign visa holders offer stiff competition and play a role in making it more challenging for mid-career professionals to land a new job once their existing Massachusetts tech job ceases to exist. Many of these foreign workers come to the U.S. on H1B or L visas. These visas are often a multiplier, where one job given to an H1B visa holder in Massachusetts translates into many jobs being sent offshore to tech workers in another land. Despite the fact that they are thriving, Massachusetts technology companies are also using visa holders to fill engineering, programming, software and hardware positions. Amazon, Amazon Robotics, Qualcomm, Intel, Phillips North America, Juniper Networks, NetApp, Fujitsu, AutoDesk, Cisco, Oracle, HP, Applied Materials, Broadcom, Audible, Experis, and Wayfair all hired and employed H1B visa holders in 2018. It is too bad Massachusetts employers and consulting companies are not looking a little closer to home to supply needed labor. With the neighboring states of Rhode Island, Connecticut, and Vermont with economies near the bottom of the U.S., there are some nearby domestic workforces that could really use a boost. With current advances in technology, Rhode Island workers could just as easily work remotely as workers in places like China, Costa Rica, India or Bulgaria are able to. Those workers in nearby states might even be able to travel to the office once or twice a month, and certainly, their English would be better than those hired to work remotely in foreign lands. With so many employers and options in Massachusetts, it is surprising that some college grads and mid-career technology professionals are finding it difficult to land a job in 2018. But they are! The Massachusetts economy has thrived for decades as it draws brilliant minds to study at some of the best institutions of higher education in the country. Without sustainable, careers offering long-term and secure employment options, however, Massachusetts runs the future risk of being broadly recognized as employing the most educated and degreed retail cashiers in the nation.